84191 • Tamiya Team Lotus 99T Honda • F103 • (Radio Controlled Model Archive) • RCScrapyard. 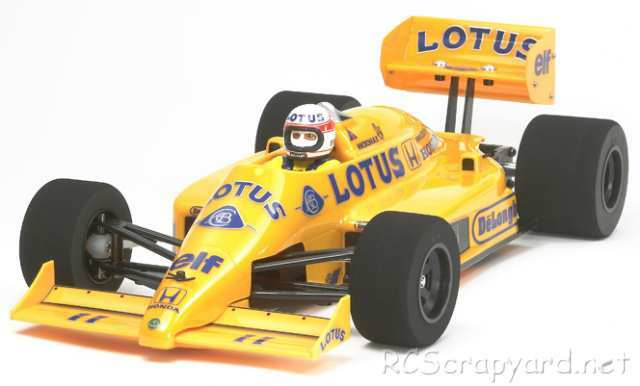 Released by Tamiya on February 26, 2011, the Team Lotus 99T Honda Kit (#84191) is No.691 of their Limited Sale Series, based on the F103 Chassis. The original Lotus Honda 99T kit (#58068) was introduced in October 1987, based on the "Road Wizard" chassis. In the old F102 the steering servo was laid on its side, this meant the tie rods were different lengths, giving the car a different turning circle on the left to that right. In the F103 the servo is held upright in a fixed frame, allowing the rods to be of even length. The kit comes with a 540 brushed Motor and Plastic bush type bearings, that after a short while, when dust and grit get into them, can actually wear into the metal drive shafts that spin in them - our recommendation is that these should be replaced by a full set of steel shielded ball bearings ASAP.